Having a foot injury or ankle injury can be a debilitating event. We use our feet and ankles to get from place to place and having an injury can really hinder our ability to do everyday activities. Foot and ankle injuries can range from simple sprains to fractures. Bioworks has the tools to help make your recovery as fast as possible. Just like most of our braces, a prescription is needed in order to bill insurance. Most insurance plans do cover these products, with a few exceptions. Majority of the braces listed you do not need to have an appointment to be fit. You will need an appointment if you have a prescription for custom foot orthotics. If you have any questions please give us a call or fill out the form below! ANKLE SPRAIN: Often caused by twisting the ankle, can range from Grade 1 (a slight stretch of ligaments) to Grade 3 (complete tear of the ligaments). It all depends on severity as to what brace the doctor prescribes. FOOT/ANKLE AVULSION FRACTURES: An avulsion fracture is when the ligament is stretched so much that a little piece of the bone becomes separated. 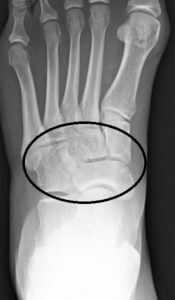 A foot avulsion fracture occurs mostly on the 5th metatarsal bone and an ankle avulsion fracture usually occurs at the distal part of the malleolus (lateral ankle bone). This is a result of either severe inversion or eversion. If conservative treatment is not enough, surgery maybe recommended. LISFRANC: A Lisfranc foot injury is a sprain or fracture in the mid-foot. The severity of the injury is based on how many of the joints of the mid-foot are affected. Some LisFranc injuries can break down the cartilage at the ends of the bones and later may develop arthritis. This foot injury is usually caused by a twist and a fall. If conservative treatment fails then surgery may be indicated. Crutches will be used to wean from not being able to put weight on your foot to some weight to eventually being able to put all of your weight on your injured foot. STRESS FRACTURE OF THE FOOT– The result of repeated trauma to the metatarsals of the foot. There may by tiny cracks visible on an x-ray to diagnose due to this foot injury. Stress fractures typically do not require surgery, but the foot will need to be immobilized for a few weeks. This type of foot injury may take a long time to heal and may require you to be non-weight-bearing. TOE FRACTURE (FRACTURE OF THE PHALANGE): A toe fracture is the result of a direct trauma to the toe. The fracture can either be nondisplaced or displaced. You will notice discoloration around the injured site and will probably have trouble flexing your toes. Most toe fractures will heal with rest and immobilization and do not require surgery. TURF TOE: A foot injury caused by hyperextension or hyperflexion of the big toe; pain will be present just underneath the toe joint. Our specialists can answer your foot/ankle injury questions. Call us or complete our contact form. We’ll get back with you with shortly.